The visit to the doctor or dentist isn’t the most pleasant experience for some. The interiors of a dental practice reception, like other hygiene practices requires a high level of cleanliness. This has led these spaces to become impersonal, sterile and adds to the feeling daunting of what to expect next. 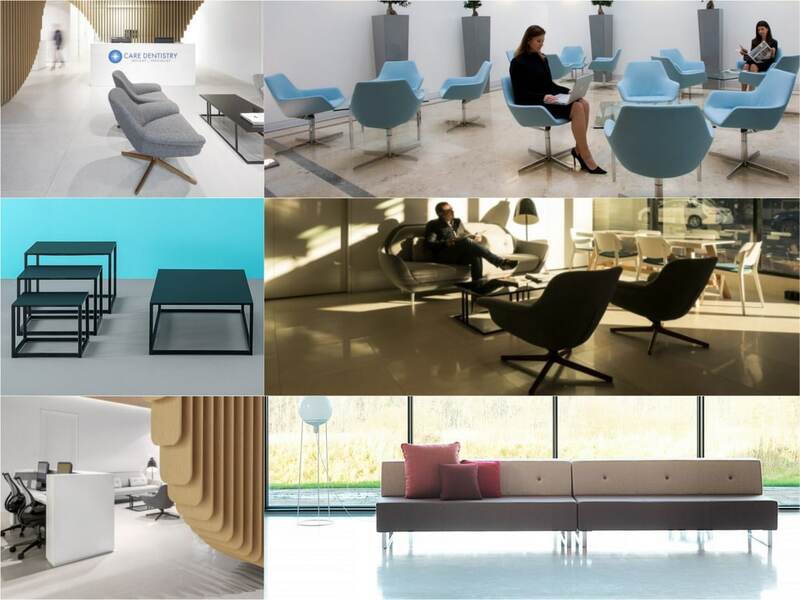 To break away from the norm without compromising on hygiene, we have put together a list of ideas from inspiring examples of modern waiting and reception rooms. 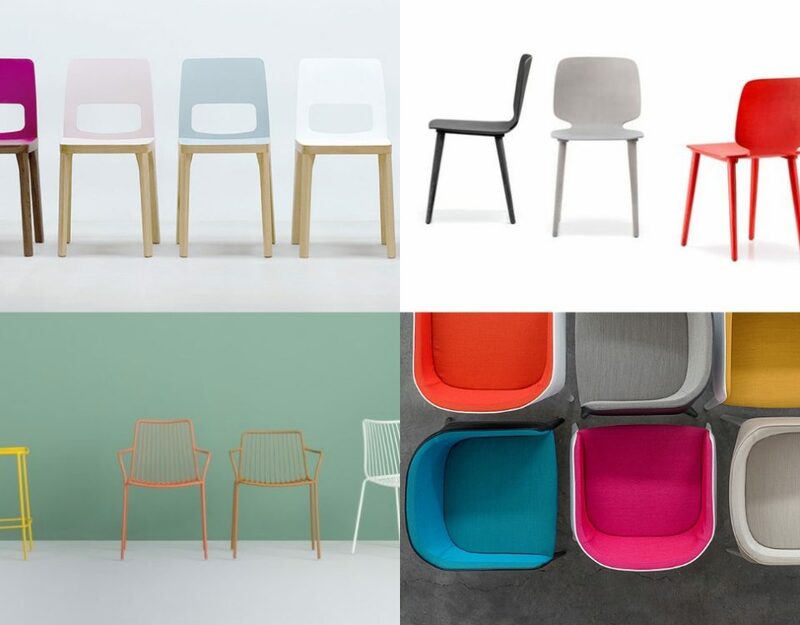 These portray a colourful and imaginative take on the classic white sterile waiting room. This modern dental practice presents a clean and simple look without conforming to a sterile environment like is seen often. Based in a small practice in Wandsworth, the reception room and waiting area features an original intricate ceiling design. In order to pertain to the calming environment, a neutral colour palette has been chosen. 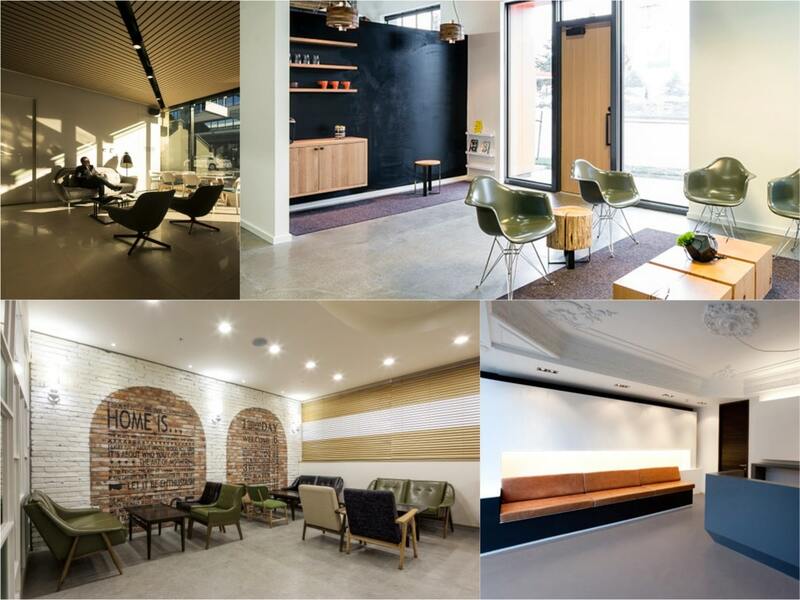 The white walls and ceilings have been coordinated with a dark grey reception desk and natural brown leather booth sofa. 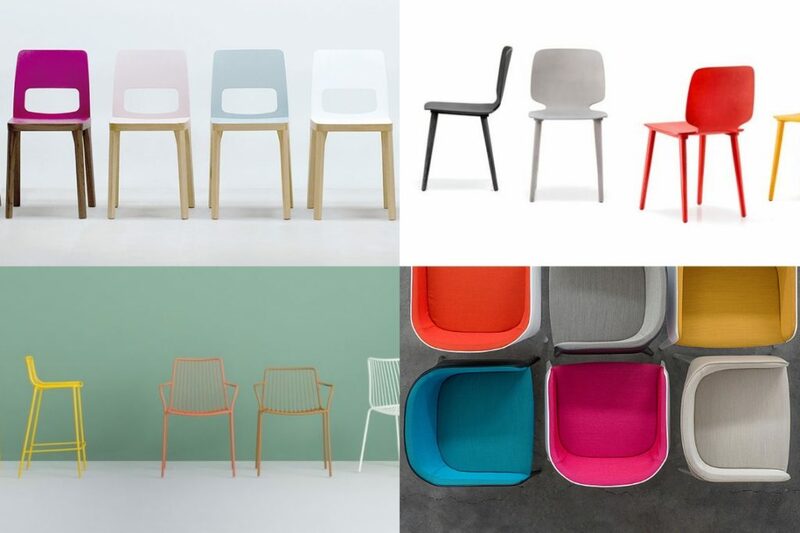 These add to the minimalist appearance of the simplistic room creating a relaxing environment for waiting patients. Presenting both modest appeal and minimal design, the XL reception desk is an ideal option for creating a simple yet highly functioning reception interior. Complete with fully integrated cable management, the desk is constructed from hard wearing melamine for those demanding needs. Adding to the simple style of the interior, we have selected the versatile Modular sofa in a booth option. The multitude of material colours allows brand matching and the selection of either fabric, leather or vinyl upholstery finishes. The vinyl option is ideal for a dental practice waiting room seating as it is easy to clean and suited for spaces with high hygiene requirements. In order to serve two separate businesses within one space, two separate reception areas have been created. The treatment of these two areas has been kept mutual but with the use of varying furnishings. To address the side of the dental practice, a sophisticated and elegant selection adds to the grown up style of this specialist practice. The light grey low reception chairs have been complimented to match the sublime white floor and soft wooden wall partition feature. The space offers a relaxing waiting area within modern settings. 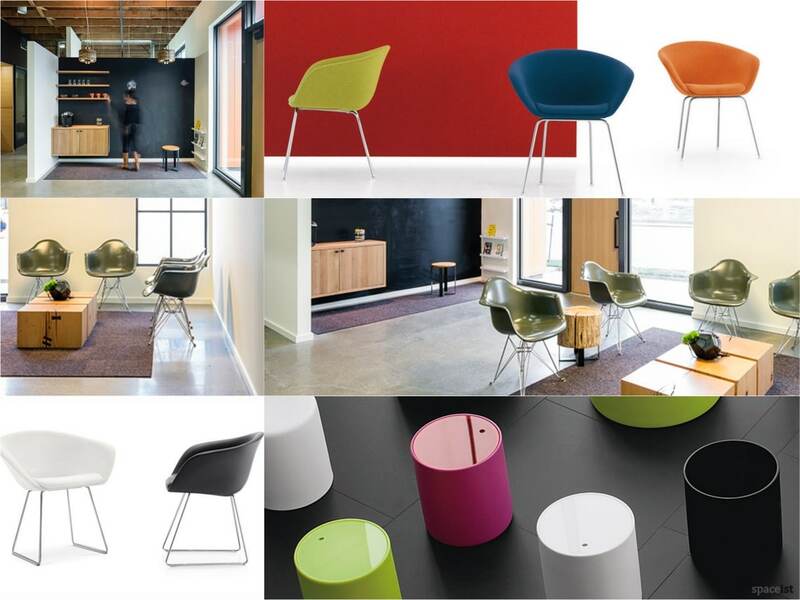 The 86 reception chair has been designed by British designer Simon Pengelly. 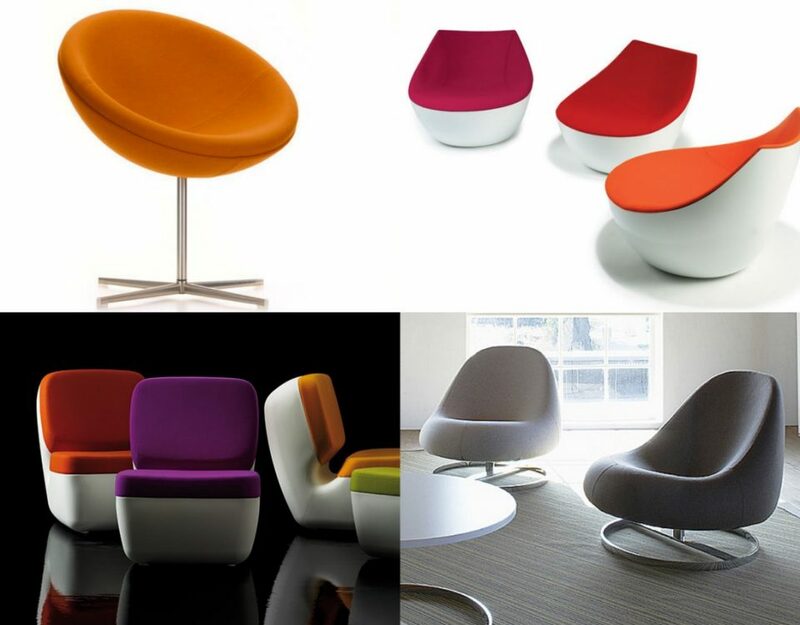 It is especially suitable for creating a visually calming and welcoming atmosphere with its slight curved form. 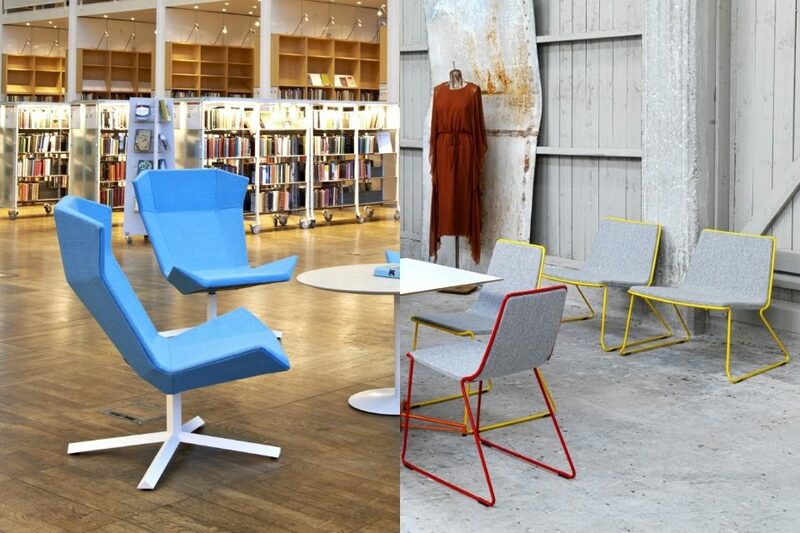 This highly robust chair is constructed from a steel frame, sprung seat and swivel base. 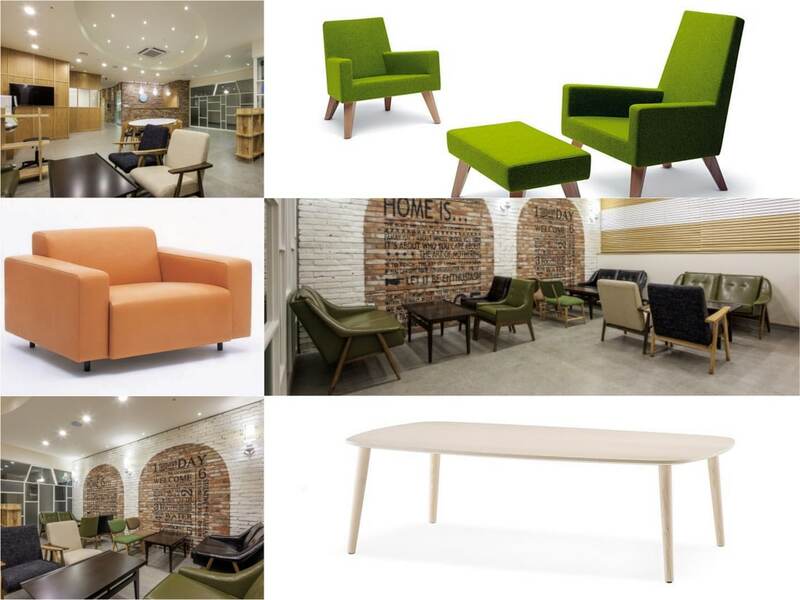 Choose from the multitude of colours and either leather, fabric or faux leather upholstery finishing. Add a comfortable sofa option with the Modular sofa and created added character with the button back option. The variety offered by the Modular sofa means it can be applied to various spaces for an individual look. The flexibility offered by the range, like this button back option means that a sophisticated look can be created to match other existing furnishings and colour tones very easily. To finish off the elegance of the space, we have selected the Code coffee table. Formed with a modern steel frame, it adds the small details that make up a well thought out waiting area. The table comes in four sizes and either a black or white solid laminate top and frame option. Presenting timeless design, the reception of this dental practice in Portland, Oregon gives us classical modern designer inspiration. The racer green Eames chairs, crisp black and white walls and wooden elements all form a contemporary look for a laid back environment. The mature theme is edgy with a black chalkboard wall and untreated, exposed ceilings. Recreate a luxurious yet edgy feel with the Duna leather chair. Created from an organic splayed shell, the form incorporates armrests into the design heightening comfort. Just as stylish as a designer chair without the price tag, the Duna leather chair comes with rodded stem sled base in a chrome finish. The Duna is especially ideal for reception areas of this nature for its variation in upholstery materials and vast colour selection. Ideal for simple yet flexible reception spaces, we would recommend the highly attractive Wow coffee table. Selected for its stylish round-form created out of a sturdy polyethylene, the glossy top doubles as a table top or stool. Just turn the top over and use the table as a stool when additional seating is required. This is especially ideal for adding simple seating for young children. Finish off the classic designer look with the 68 coffee table. With the option of an oak or walnut veneer table top, or laminate, the table features matching chrome base legs to match the Duna chair. 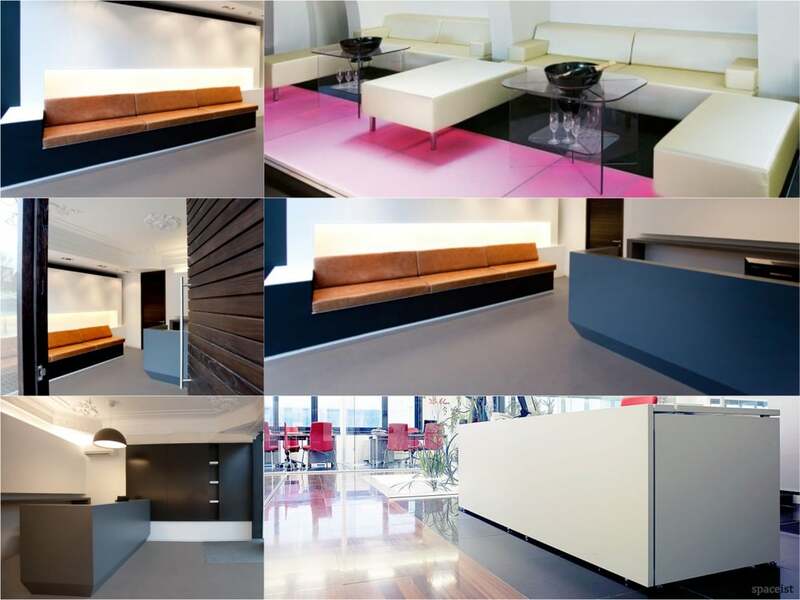 This is an ideal option for creating functional reception spaces on a budget without comprising on designer inspiration. A visit to the dentist is usually daunting but a visit to the cozy and home-like atmosphere at Our Family Dental Clinic in Hwaseong-si will change your mind. With the use of warm wooden tones, a creative mixture of upholstery, textures and colours brings together what would have become a mismatching space. By integrating a range of colours and textures, the design of this reception space creates a comfortable and non-intimidating atmosphere a medical reception space could offer. Add curves and warm wooden tones with the Malmo coffee table. The table features a soft edged rectangular top made from solid laminate with solid ash legs. The rounded edges are ideal for high-impact application. 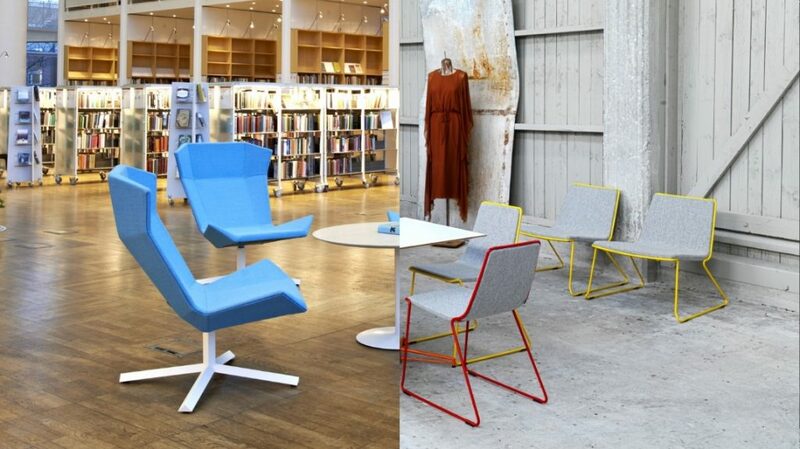 The Malmo comes in a selection of sizes and a ‘squoval’ shape that is a cross between a square and a circle. For creating the cozy and comfortable environment, we recommend the 44 reception chair. This low seat option is constructed with a wide seat with carefully selected grade foam to heighten comfort. With fabric, leather and faux leather upholstery options included, choose from a wide range of colours to create a calming interior. Further comfort can be created in a modern reception space with the Seventeen leather chair. The unconventionally wide, deep and low form gives this reception sofa a home-like level of comfort but in contract grade quality. The leather or faux leather material is ideal for dental practice reception application, with a vast colour palette to choose from.